Artichoke is a year-round plant with purple flowers. Although artichokes are considered as vegetables, the part that is eaten is essentially unopened bud of a flower. The leaves and roots of the Artichoke are used as a cure for some disease, from irritable bowel syndrome to prevent a hangover. There are more than 50 types of artichokes. 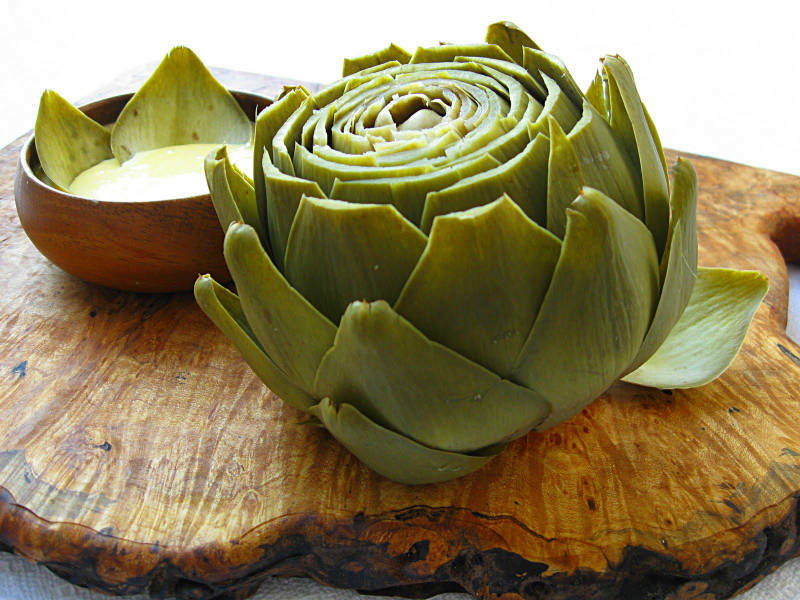 As food, Artichoke contains 25 calories and 3 grams of fiber, Vitamin C, folates, magnesium, calcium, iron and sodium. Artichoke leaves contain cynarin, an ingredient that helps in lowering cholesterol. Artichoke leaves are granted for certain medical conditions in the German Commission E-Monographs, guide to herbal medicines, such as diseases of the liver and gallbladder and decreased appetite. In the U.S. artichoke is advertised as a dietary supplement because it is not approved by the FDA (United States Food and Drug Administration) and it is not determined its safety and efficacy and the recommended dose. Artichokes are used as an aphrodisiac in folk medicine, but also for other conditions, such as anemia, arthritis, gallstones, itching and snakebite. More recently, artichoke is used as a remedy for high cholesterol, problems with digestion and loss of appetite. It is believed that artichoke enhances excretion of bile and helps with the digestion problems. Irritable Bowel Syndrome Treatment – In a study of 208 people, diagnosed with irritable bowel syndrome, participants were assessed two months before and after treatment with 320 mg or 640 mg extract of artichoke leaf. During the test, participants reported 26.4% reduction in irritable intestine syndrome, as noted in the American Journal of Health-System Pharmacy, dosing did not made significant difference in outcome. The study concludes that artichoke may relieve some of the symptoms associated with irritable intestine syndrome or dyspepsia (problems with digestion). Lowers Cholesterol – Artichoke contains components like cynarin and lactones that are helpful for preventing cholesterol synthesis, keeping the heart healthy. It improves the secretion of bile that causes the reduction of overall cholesterol levels in the blood. Aids Digestion – The cynarin and fiber in artichokes make them a great tool in maintaining a healthy digestive system. The bile-producing cynarin alleviates bloating and other digestive pain. Fiber helps break down food and keep the digestive system moving. Inulin, one of the major sources of fiber in artichokes, is a prebiotic. Prebiotic increases the amount of probiotic bacteria in your stomach. Improves the Liver Health – Artichokes were used as traditional liver tonics for centuries, but the exact mechanism of their impact was never full understood until modern science could properly research this versatile plant. Two antioxidants (again!) found in artichokes, cynarin and silymarin, have been shown to improve the overall health of the liver by reducing the presence of toxins and facilitating their elimination from the liver and the body. Some studies have even shown these antioxidants to actively promote regrowth and repair of damaged liver cells, which is one of the slowest organs in the body to regenerate. It seems that modern medicine finally caught up with what traditional medicine has known for generations! Cures Hangover – As mentioned earlier, artichokes can be a great salve to the liver, and can reduce any blockage, as well as reduce the levels of toxins in the blood by eliminating them quickly from the body. Therefore, artichokes make for a perfect hangover cure, and some people choose to chew on a few artichoke leaves after a night of heavy drinking! Promotes Bone Health – Artichokes are one of the best foods on the market for acquiring vitamins and minerals, particularly minerals like magnesium, phosphorous, and manganese. These minerals are essential parts of increasing bone health and density, thereby reducing the chances of conditions like osteoporosis. Artichoke plant is available in capsule and in a form of extract. The capsule strength ranges from 170 to 320 mg and people should follow the recommendations on the package. The average dose is 600 mg for capsules per day and daily doses of artichoke leaf extract is about 500 mg.
People should discuss with their doctor about the dosage. This is especially important for women who are pregnant or breastfeeding women and people diagnosed with diabetes, high blood pressure, blockage of the liver and cardiovascular diseases. Note: Due to lack of information on its safety, artichoke leaf extract should not be administered to children under 12 years, pregnant women and breastfeeding women and to people who have kidney disease, liver disease and persons with obstruction of the bile roads. Also artichokes in two forms, herbal and as a food should be avoided from people who are allergic to calendula, chrysanthemums and margaritas.